For Chip Kelly, returning to coach college football is inevitable. College football season is on the horizon and the pressure to win has never been higher. Several prominent coaches will be in win-now mode if they want to stay employed. Will Brian Kelly survive at Notre Dame? What about UCLA’s Jim Mora? In the Southeastern Conference, every coach not named Nick Saban is one terrible season away from being on the chopping block. If your program has a Condition: Critical Coach, here is a list of five guys who aren’t currently head coaches, but your athletic director should have on speed dial. Chip Kelly is the No. 1 available free agent coach on the market. No one else is even close. His ESPN gig will allow him an opportunity to promote himself while also surveying the landscape for his next destination. Kelly has virtually everything an AD would look for in a coach. He’s had success at major-college program (46–7 at Oregon). He has NFL experience (Philadelphia Eagles and San Francisco 49ers) and an exciting style of play. In short, Kelly is an easy sell to boosters and recruits. Kelly should have his pick of available jobs this winter. What are the best potential fits for Kelly? The job that seems to make a lot of sense is UCLA. Kelly has Pac-12 experience and recruited Southern California heavily when he was at Oregon. UCLA has always been in the football shadow of USC, but Kelly could change that. The question is: would historically stingy UCLA be willing to pay? If not, others will. Texas A&M has the wealthiest athletic department in the country (yes, more money than Texas). If the Aggies are tired of being on the Kevin Sumlin rollercoaster, this move would make sense. However, they might find themselves in a bidding war with another SEC school like Tennessee or Arkansas. Yes, schools will shy away from Miles because of his age. But if you think Miles is too old, consider that Saban is two years older. And yes, Miles has quirks. But you would be hard-pressed to find anyone with a better overall résumé. Miles won a national championship at LSU. His overall record is 141–55 (Oklahoma State and LSU). His biggest downfall: he didn’t beat Saban enough. And the guy who replaced him at LSU – Ed Orgeron – is not as good a coach (22-29 record). If Miles were 10 years younger, he would already have a new job. 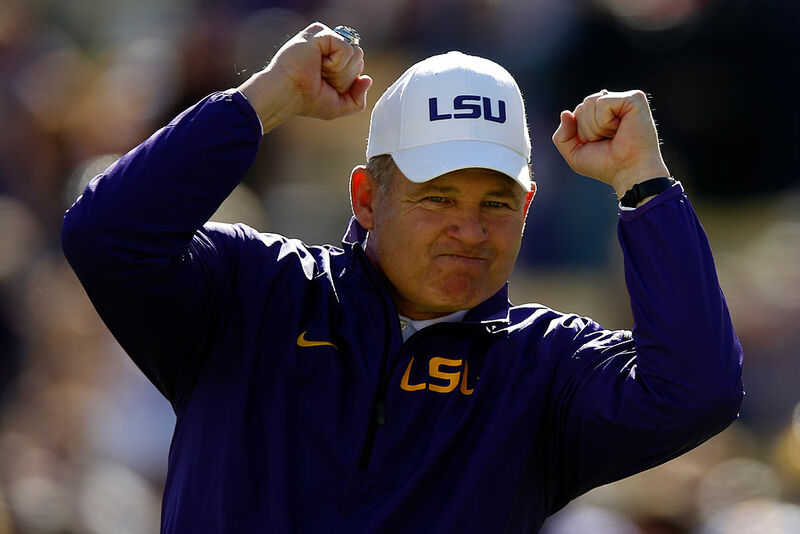 Les Miles, fired last September during 12th season at LSU, on his immediate future: "I want to coach football. That's pretty simple." Miles was rumored to be a candidate for numerous openings last year, including Minnesota, Houston and Baylor. Miles has said that he will not limit himself to strictly Power 5 schools, but that seems unlikely unless it’s a good job. Miles’ best bet might be a return to the SEC. What about the Mississippi schools? Hugh Freeze is living on borrowed time at Ole Miss due to an NCAA scandal. Miles would bring credibility and stability. Dan Mullen at Mississippi State might get a better job offer somewhere else after taking the Bulldogs as far as they can go (ranked No.1 in October 2014, thanks to Dak Prescott). Again, Miles would be a solid hire there. Greg Schiano is in a great spot. He’s the assistant head coach for Urban Meyer. Every year, he’s going to have elite recruits who will make him look good and the Buckeyes will be a contender for the national championship. If Meyer ever decides to quit, as he did at Florida, Schiano will be a strong candidate for that job. However, if Schiano doesn’t want to wait anymore, he’ll have a long list of suitors. What Schiano did as Rutgers head coach was one of the best coaching jobs in recent memory. He took a program that was a punchline to being ranked No. 7 in the country in 2006. The Scarlet Knights’ victory over No. 3 Louisville that year is the biggest in school history. If not for Schiano, Rutgers might not have been invited into the Big Ten. Schiano jumped from Rutgers to the NFL where after a promising start, he flamed out with the Tampa Bay Buccaneers. Schiano is a very good coach and some program will be lucky to have him. It’s amazing what working for Nick Saban can do for your image. A few years ago, Sarkisian was ousted from USC when his battle with alcoholism became public knowledge. Sark went to work on Alabama’s staff and was promoted to offensive coordinator before last season’s national championship game when Lane Kiffin left for Florida Atlantic. Sarkisian parlayed that one-game stint into becoming the offensive coordinator for the Falcons. Calling plays should be easy with NFL MVP Matt Ryan and Julio Jones, who sparked the league’s highest scoring offense. Sarkisian is still continuing his treatment for alcoholism and said that he’s doing “great.” He’s sending a message to possible future employers. Sarkisian’s head coaching experience is all in the Pac-12 (Washington and USC) and he’s been a West Coast guy most of his career. It stands to reason that Sarkisian will look for chances out West. If a job opens up at Arizona State, Arizona or UNLV, that might be a good landing spot. Everybody loves Jim Harbaugh. Well, everyone except for the rest of the Big Ten. He might be the most charismatic coach in the nation. He seems to be in tune with today’s young people. So why not hire the guy who has been with Harbaugh for most of his coaching career? Drevno has been tethered to Harbaugh since 2004 when Harbaugh was a head coach at San Diego. He followed him to Stanford and the San Francisco 49ers. Drevno left Harbaugh in 2014, but reunited with his old boss when Harbaugh went back to college to take over Michigan. Drevno was a candidate for a few jobs last year: FAU, San Jose State and Western Michigan. With another strong season, Drevno should be in the mix for jobs again.